My goodness! There is so much Rachael Ray news to report today! 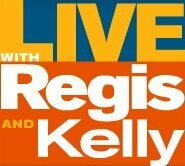 Rachael Ray will appear on Live with Regis and Kelly tomorrow morning. According to the Live with Regis and Kelly website, "Rachael Ray makes Drunken Tuscan Pasta, a recipe from her new cookbook, 'Express Lane Meals.'" Yeah TiVo! We'll have to see who is perkier - Rachael or Kelly.